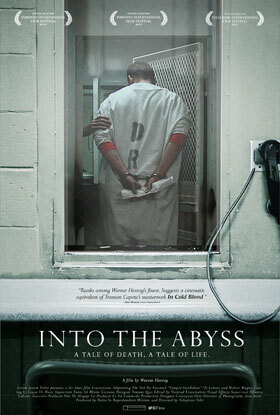 This is a film about the death penalty. The filmmaker, Werner Herzog, makes no attempt to conceal the fact that he opposes capital-punishment. Normally, I would consider that a mistake because it prejudices the film. You know that the filmmaker is going to slant the story in a way that will bolster his point of view. In this case, the filmmaker makes a fair attempt at showing all sides of the debate while not slanting things in any one direction. For that I give him credit. And for the record, I, too, am against the death penalty. In my opinion, the death penalty is government sanctioned murder. It doesn’t undo the harm that resulted from the crime. It doesn’t act as a deterrent. And the justice system is too flawed for it to be fair and equitable. You don’t see rich people being executed. In many ways, this film reminded me of the movie Dead Man Walking starring Sean Penn. Both share a similar sentiment in that you can’t judge a person through the lens of a single horrific incident. There is always more to the story. This particular story involves a triple homicide. The motive: two teenagers, Michael Perry and Jason Burkett, wanted a particular car owned by one of the victims. It was a senseless, horrific crime. The two boys, who were only eighteen at the time, were tried separately. Michael Perry was given the death penalty. Jason Burkett was given forty to life. That outcome alone tells part of the story. Why should one person involved in the same crime be spared the death penalty over the other? I’m a fan of Werner Herzog. He has been involved in some great documentaries. One that I highly recommend is Grizzly Man. I’m not a fan of the way he often interjects himself into the story. In this case, you hear him as the interviewer. I much prefer letting the story unfold through the participants. And while he does a fair job of presenting a balanced story. There are some missing elements. For one, we hear from a number of people who paint a picture of who Jason Burkett is and how he came to be where he is now. But we don’t hear from a single family member of Michael Perry. Now I understand that perhaps they refused to participate. But he could have at least stated that fact in the film. There were also a number of instances where I felt more information was needed. For example, both Michael Perry and Jason Burkett claim that they did not murder the three victims. So when Michael Perry claims that he is innocent, why doesn’t Werner confront him with the facts: He confessed and pointed detectives to the victim’s bodies. His DNA was found on a cigarette beneath the body of one victim. He and Jason Burkett were driving two vehicles owned by the victims. It boils down to the fact that they were both there but each is blaming the other for the killings. And that may very well have been the case, not that it makes much difference in the eyes of the law. But I would have liked more of that evidence spelled out. There was also conflicting accounts of the shootout that occurred when Perry and Burkett were arrested. One version is that there was a wild shootout with police and the two suspects. Jason Burkett’s account is that he was asleep in the car when the police just started firing. So whose right? Michael Perry is the one facing execution. But we learn very little about him in the film. Jason Burkett, on the other hand, we learn a great deal about. We learn about his troubled upbringing; his health issues as a child, his incarcerated father and brother, and his wife, whom he met while in prison. Nothing can excuse the killing of three innocent people, but you can’t listen to Burkett’s story and realise that things could have been so different for him if he had had a better start in life. This is a fair and balanced look at the death penalty debate and should be required vieweing for anyone even remotely interested in this topic. The DVD did not contain any extras. I think it was a missed opportunity byWerner Herzog to fill in the missing pieces.